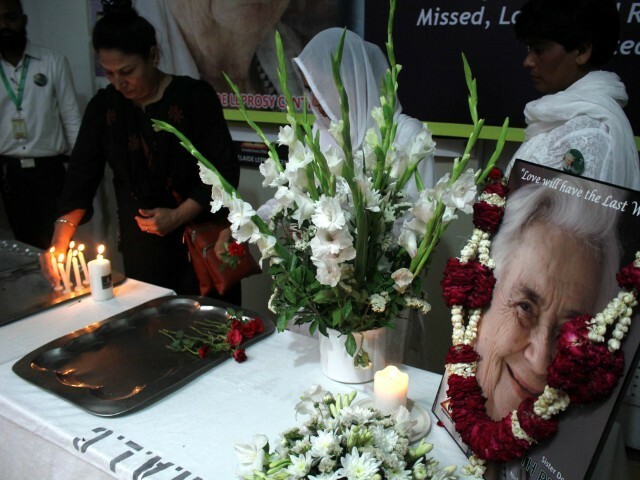 KARACHI: First death anniversary of Dr Ruth Pfau, a German nun who dedicated her life to eradicating leprosy in Pakistan, was celebrated with special services held at St Patrick’s Cathedral by Cardinal Joseph Coutts followed by a visit to her grave and a candle light vigil at Marie Adelaide Leprosy Centre (MALC). She has been described as Pakistan’s Mother Teresa and was remembered all across the country for her selfless services for the people of Pakistan. Addressing the well-wishers and patients of Dr Pfau during the vigil, MALC Chief Executive Officer Mervyn Fracis Lobo said that with her commitment she was able to unite people of all faiths in her long fight against leprosy in Pakistan. He added that due to her selfless efforts, a disease like leprosy was now under control however, it has yet to be completely eradicated. According to him, 300 to 400 cases of leprosy were still being reported in the country out of which more than 50% were from Sindh. Lobo also said that she was more Pakistani than a Pakistani and used to repeatedly say that it’s Pakistani people who fought against leprosy. The Government of Pakistan made Dr Pfau the federal ambassador for leprosy patients in 1979 and in 1988 Dr Pfao was given the Pakistani citizenship. “Dr Pfau’s services were acknowledged by the state, but the people were unaware about her services until her death,” he said adding that it was due to her struggle and dedication that Pakistan was declared the first leprosy-free country of Asia in 1996. On these services of hers, the government of Pakistan awarded her with Hilal Pakistan, Sitara Quaid-e-Azam, Hilal-e-Imtiaz, Jinnah Award and Nishan-e-Quaid-e-Azam. Agha Khan University gave her the Doctor of Science award while the German government awarded her with Bam-B Award. Dr Pfau devoted the last 50 years of her life to fighting leprosy in Pakistan. She came to the country when she was just 29 and after witnessing the suffering of the country’s leprosy patients she decided to stay. She trained Pakistani doctors and attracted foreign donations, founding Pakistan’s National Leprosy Control Programme and MALC, which is now operational in all provinces of Pakistan, including Gilgit-Baltistan. She has treated over 50,000 families since the establishment of the centre. She travelled to various parts of Pakistan to medically facilitate leprosy patients, a journey she said she enjoyed tremendously because of the marked difference it made in the lives of her patients. Dr Pfau was also on the front line when Sindh was hit by floods in 2010. In May this year, State Bank of Pakistan Governor Tariq Bajwa along with German Ambassador to Pakistan Martin Kobler unveiled Rs50 commemorative coin in recognition of meritorious services rendered by Dr Pfau.